Right! You've got Resolume installed so let's jump in and see what it can do, shall we? Run the Resolume application. The Resolume interface will appear. It may look complicated at first but don't worry - it will soon all make sense. A new Resolume install comes with a demo composition. A composition is what we call a complete Resolume setup - each composition can include sets of clips, preprogrammed effects and all other settings that you need for a performance. Below the menu bar, you should see a set of horizontal rows that each have some controls on the left and a set of thumbnails. Each thumbnail is a different clip. Go ahead and click one of the thumbnails now. The clip will start playing. Note that these clips are set up to be synchronised to the BPM (Beats Per Minute) setting, so the clip may not start playing instantly - it will wait for the start of the next bar. Don't worry, if you want to launch clips instantly, you can set them up to do that. But first things first. You should now see the clip playing in the output window on the left and hear the audio of the clip. Awesome. You're VJ'ing. You can take control of the clip that is playing by clicking the Clip tab. The Transport section of this tab is the bit we are interested in for now. You can use the Forwards, Backwards and Pause icons to start and stop the clip. You can also grab the moving blue wedge directly to scratch the clip - wikka wikka wah! Note that messing with the clip like this will mean that it is no longer synchronised with the BPM - the tempo will be right but it will be out of phase. You can resynchronise it by clicking the clip thumbnail again - it will start again at the start of the next bar. Playing one clip is all very well but mixing clips together is where the fun really starts. Each of the horizontal rows of clips is a separate layer. Each layer can play one clip at a time. Try clicking another thumbnail on the same layer as the one that is already playing. You will see that, at the start of the next bar, the output will change to play the new clip. Now try clicking a clip from a different layer. This time, the old clip will continue playing and the new clip will be mixed with it. Have a look over to the left of the thumbnails. There are two vertical sliders marked 'A' and 'V'. Try sliding these up and down on the layers that you have playing. Logically enough, the 'A' slider fades the audio of the layer in and out. The 'V' slider does the same for video. You can also use the 'M' (master) slider to control both at the same time. So we've got some clips playing. Let's mess with them using some effects. Over on the right hand side of the interface are some tabs that say 'Files', 'Compositions', 'Effects' and 'Sources'. Select the Effects tab. Below the tab will now be a list of effects. These are the video effects that are included with Resolume. Pick an effect. Any effect will do, but I recommend Bendoscope as a good one to start with. Now drag it over to the left where there is a tab called Composition. As you get over there, drop the effect in the area where it says 'Drop effect or mask here'. You'll know when you're in the right place when you see four colored corners appear around the Composition tab. You should immediately see that the output video has been distorted by the effect. Such trippy. Now, look back to the place where you dropped the effect. You will see that there are two sliders under the Bendoscope effect. All video effects have the Opacity slider - it is used to mix the effected video with the original. Mos t effects also have additional parameters that you can control. Bendoscope has one - the number of divisions used in its distortion effect. Try sliding this slider to the left and right to see what effect it has on the output video. More such trippy. You can add more effects by dragging them over from the Effects tab. Each effect takes the output of the one before it and effects it, so you can combine many effects to make something beautiful. Or a great big mess. If you want to get rid of an effect, just click the x to the right of the Effect's name. Now is a good time to have a play with Resolume. Play some clips, add some effects. See what happens. Most of all, have fun! A useful feature is the help window in the bottom right of the interface. This will show some brief hints about how to use whatever the mouse pointer is currently over. 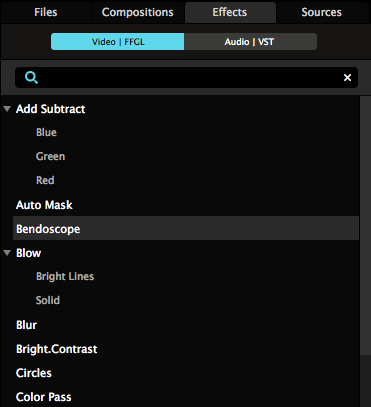 In the other sections of the manual, we will be looking in detail at all of the features of Resolume, so if you come across anything that interests you, you will be able to find out how to use it.